Wine exam over – phew! – so it’s now time to get stuck into revision for next week’s theory papers. Meanwhile, we’re treating ourselves very well in the house. I made my second pair of sourdough loaves yesterday and, when I brought them home, the Ranelagh Housemate produced his home-cured bacon so we had the Best Bacon Butties Ever with our homemade bread and bacon, followed by a side order of Homemade Noodles with Chicken Liver Sauce for the Husband, scrounged from school for the Husband. 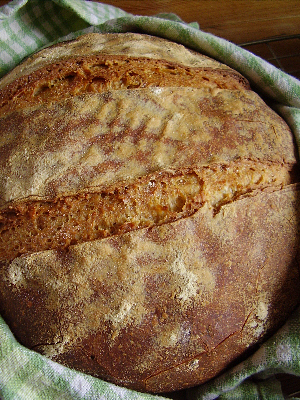 Besides the sourdough, which is working amazingly – and surprisingly! – well, this week is pretty full on in the kitchens. Final full week of cooking. After this week, I think we just have Monday left and that’s it. 12 weeks – almost – over and it’s back to real life soon. Caroline,I love sour dough. I made my first sourdough starter at Ballymaloe, she (Mable) managed to reach her second birthday before a small period of neglect meant I had to throw her out. Luckily I now have a sister (Masie) made from some of Mable I’d dried out on a baking tray. I’d love some details on your feeding regime, proving times quanitied etc…Have you tried the ‘no knead bread technique?’ I know it was not around when I was at the school but I’ve played around with it an have got great results. It’s great to hear from someone that has managed to keep their sourdough starter all this time (almost!). The Husband and I worked on sourdoughs a few years ago but didn’t get on very well – only got about one usable loaf out of eight or nine attempts – but this time round it’s working out brilliantly. I’ve another pair of loaves on the go as I type. At the moment I’m using the starter a lot so it’s easy manage. I am (sort of) following the instructions as given to us on the course for Mary Jo’s Sourdough – two 8oz feeds of flour and water two days before I want the loaf (morning and evening, day 1), mix dough morning of day 2 and set to prove, knock back and shape evening of day 2, prove overnight in fridge, bring to room temperature morning of day 3 for a couple of hours and bake for 40 minutes. Easy-ish!I used to make the No-Knead Bread every week! You can read more about my adventures with it here – I loved it, easy, always successful and an absolutely fabulous almost-sourdough taste. I did destroy the handle on the lid of one of my cast iron pots, though, with the high heat! The course sounds like it has been very worthwhile Caroline. I’m sure you will enjoy a break though as it must have been full on. Caroline,I didn’t get the Mary Jo’s Sourdough recipe when I was on the course and don’t think I’ve seen it in in any of the Ballymaloe books, was she an ex-student?I’m using a basic recipe I got from egullet.com. 3 cups of bread flour, 2 cups of refreshed starter, one cup of water and a god pinch of salt. You’re right Barbara, I’m so looking forward to having next week off! I’m starting my new job in URRU, just down the road from me in Mallow, then the following Monday. One week of down time, then madness again!I think that Mary Jo was a former teacher at Ballymaloe? I’m not sure actually! Her recipe is 30fl oz of starter, 1½lbs of strong flour, 1 tablespoon each of wheatgerm and rye flour and 3-6fl oz water sprinkling on 2½ teaspoons of salt just as you start to kneed. Just took another pair of loaves out of the oven. Does yours crackle away merrily as it cools?